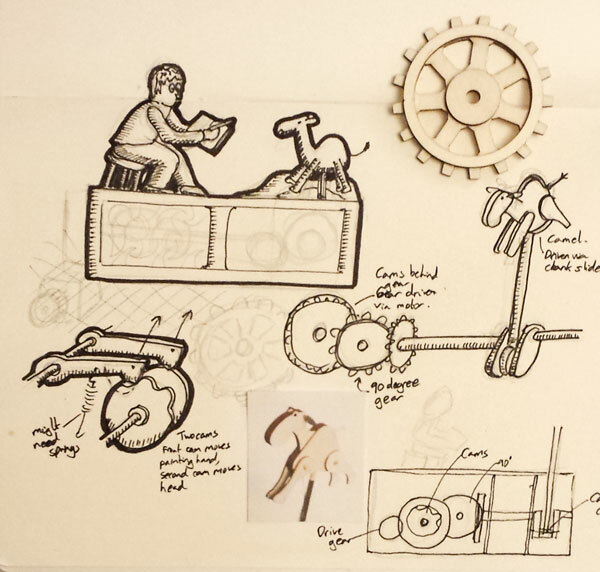 I‘m right at the beginning of the long process of designing twenty wood & metal automata for the Cumbria Archive. My current task is to design a model featuring a Cumbrian man who spent years overseas during WW1. Whilst there he wrote many letters home, One that caught our eye featured a small painting of a local camel, perfect, we thought, for subject of an automata. My initial plan is to have the character seated at one end of the automata looking up and down from sketchpad to subject and making suitable painting movements. I’ve decided to take liberties with perspective so I’m making the camel much smaller than the man. I was originally going to use a chain drive to move the camel but in the end decided that a rotating shaft would be much better from a maintenance point of view. Time to test out the mechanism to see if it works. I’m using a laser cutter to make the pieces so a bevel gear is out of the question. 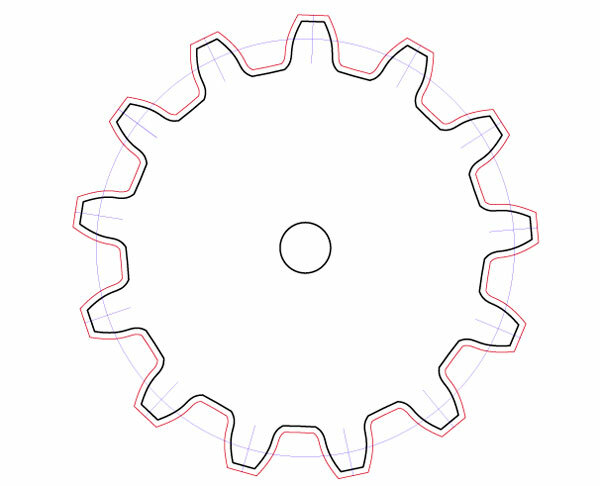 Laser cutters can only cut out flat shapes. 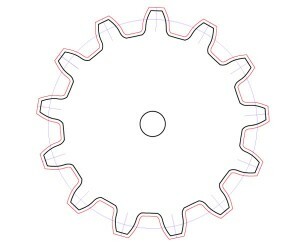 The gear design program I use creates proper involute gear profiles. 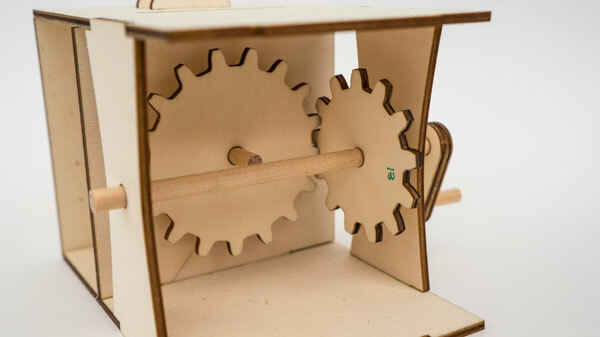 These work excellently where the gears are next to each other but gears set at ninety degrees to each other need a little bit of modification. I tried out a few different ideas and in the end landed on this simple solution. In this picture the original gear profile is shown by the fine red line. I’ve then used one of the features in Illustrator to create a new profile by offsetting the line by three quarters of a millimetre. Here’s the first gear. 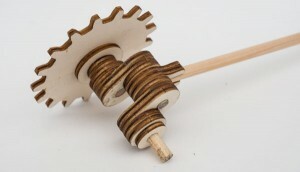 A thirteen tooth gear mounted on a drive shaft and and fitted with a handle. The second gear has seventeen teeth and is connected to a crank and push rod which will eventually drive the camel. The two gears then mesh together nicely in the laser cut box. Once assembled the Camel moves smoothly. 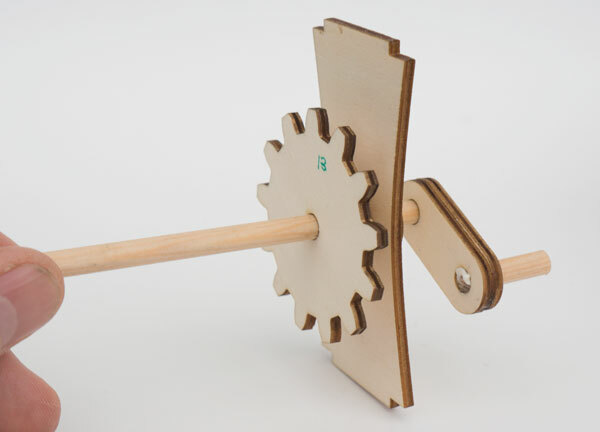 Next step – Having proved the concept of the horizontal drive shaft, time to design the rest of the model! The camel itself might make a nice Instructable.